The highest value of the coconut definitive also took the hardest fall from glory when the war ended. Whether misaligned portraits, damaged plates, defective ink, forgery or a demotion to middle-class colours, the $5 has it all. To begin with, there were fewer than 12,000 copies left of the old $5 on green paper (Cockburn 1998), not a large number by the standards of mass-production definitive stamps. In July 2016, a complete sheet sold at Murray Payne for £9,250. The presentation pack distributed at the Paris Universal Postal Union Congress in 1947 excluded it (Chua 1988). This stamp could be exchanged for rice and cigarettes (Cockburn 1998). You could get a day’s worth of rice, about 600 g or 1 kati, on the black market—that’s over 50 times the official price (Kratoska 1988) and over three times the daily wage of about $1.50 (Harper 2001). The government set the price at 8¢ a kati (The Straits Times articles 1|2) but capped sales at about one-fifth of a kati per head per day; protests turned violent and troops fired on crowds (Harper 2001). French philatelic forgeries are known, where fake BMA overprints were added to used unoverprinted $5 stamps (Cockburn 1998), which were of much lower value. Forgeries have also been reported by Wells (1963), Murray Payne (1996), French (2000) and Elliot & McClellan (2001). 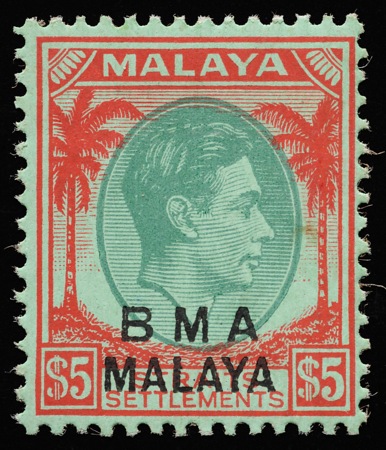 See forged BMA overprints for an example. The $5 later took on a new but short-lived colour scheme inherited, perhaps conveniently, from the pre-war 30c which was now no longer in use. Along with the $1 now printed on white paper, it also heralded the end of a glorious era of opulent coloured papers as the world descended into austerity after the war. Cockburn (2010) documents a horizontal strip of three specimen stamps with the middle one missing the SPECIMEN perfin. 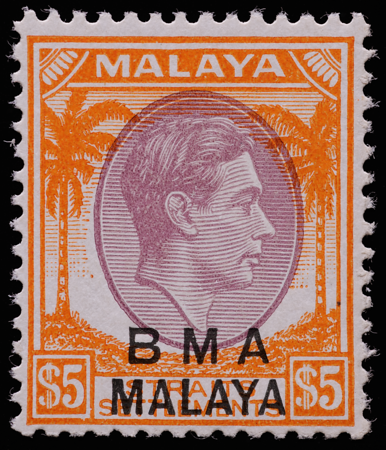 In 1995, this was one of the two BMA values digitally reproduced on Singapore stamps commemorating the 50th anniversary of the end of the war. 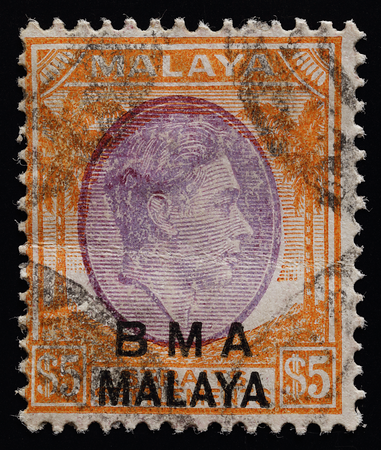 A major biaxial plate shift, the vignette touching the horizontal bar below 'MALAYA' and leaving gaping white spaces both below and to the left of the oval, showing the dismal quality control during the BMA period. The author has also seen a case of the bottom of the vignette shifted all the way down to the bottom of the soil. The only known example of a retouched coconut definitive, discovered by Dickon Pollard (pers. comm.). A large patch of missing hair at the top of the head has been painted in by hand apparently using the same ink. Post-war paper shortages likely necessitated this expedient. For discussion on how one-of-a-kind items are authenticated by circumstantial evidence, see Gregory (2006). 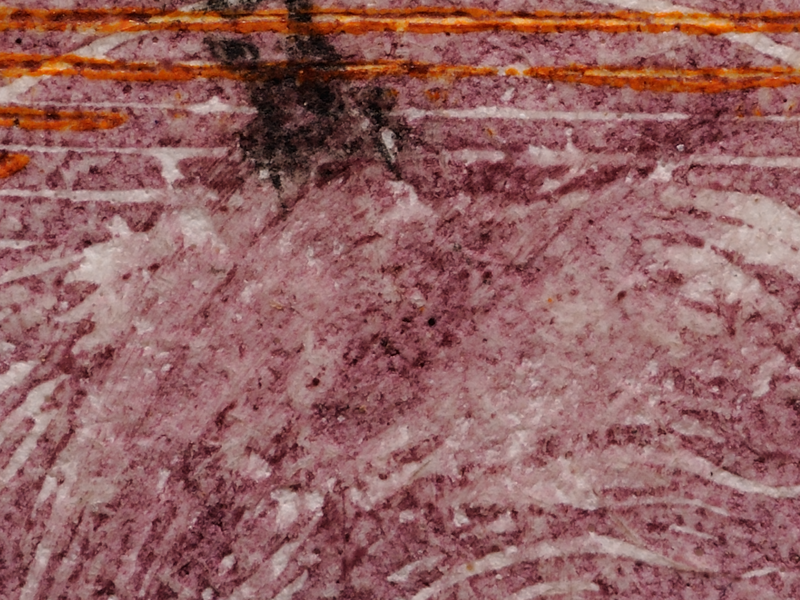 Magnification of the hand-painted retouch showing the oblique brush strokes. The plate damage was quite extensive and the repair sufficed to make the stamp presentable if not true to detail. A less common variant of the new $5, with lighter duty plate and more vivid but 'friable' key plate. This example, with its crease and four-corner postmarks, exudes a time-worn beauty. 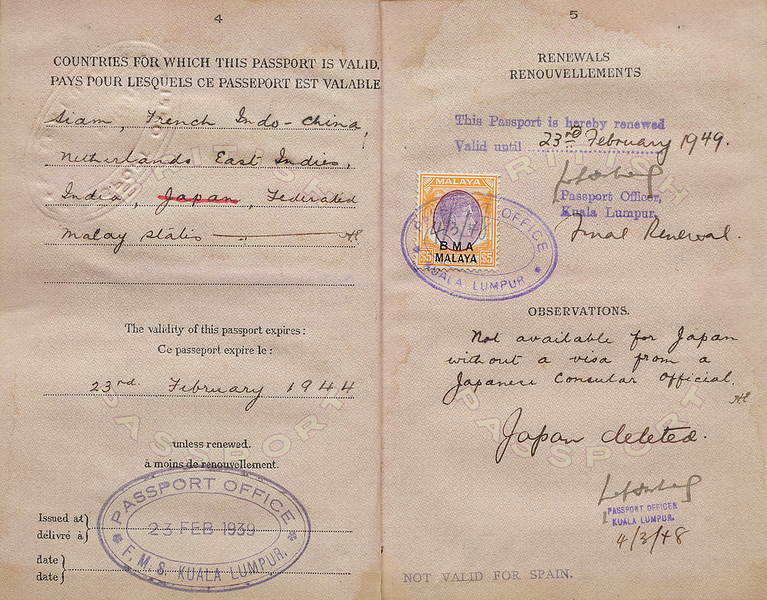 The $5 with a Passport Office cancellation and handwritten date on a passport that survived the war. Validity for Japan was revoked with a strikethrough in red ink and a country deletion note on the facing page. 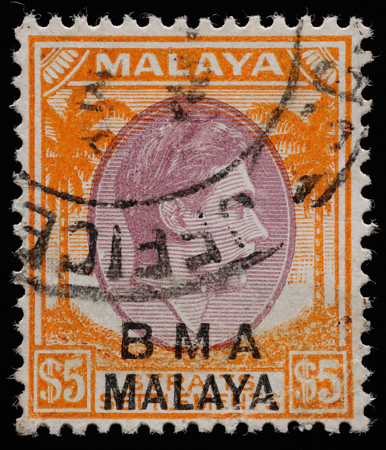 A Leitmotiv in Malayan life, the coconut definitive appeared on every sort of document—notary, insurance policy, invoice, property rental receipt, certificate of identity, passport and others.